My genie scout was working fine, until I decided to open it again, and this error pops up everytime I try to load the scout. 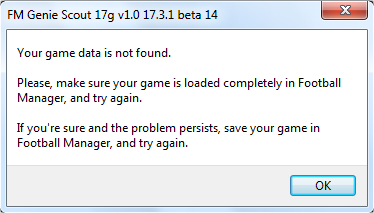 I was using beta 16, because i thought maybe that was the problem, then i switched back to beta 14 and the error still shows up. It's everything ok with my save. And I don't if there is a new update on FM, but I would like to know what I should do to fix this. Genie Scout is not compatible with FM beta-versions. It seems you activated public-beta updates in Steam options, so your game version is not the one supported by the GS beta 16.
i have the same problem. I did not activate any public beta updtate on steams. Yesterday worked, now not! What can i do? me too, yesterday was fine, today... nothing.